Factair continues to support these products as well as a range of other bespoke military systems. The benefits of using compressed air power tools have long since been known in the automotive and commercial field vehicle workshop environment. However, if the vehicles you need to maintain are in remote field locations, then you not only require the speed and efficiency compressed air power tools provide, but also compact transportable air compressors, powerful enough to operate all the tools and equipment. These mobile diesel engine driven compressors are used for a wide variety of ground support applications with the Royal-Air Force. These instruments automatically test the quality of breathing-air in accordance with BS EN12021:2014. The Dive-Check provides a quick and easy method for checking the levels of water, oil, carbon monoxide and carbon dioxide in breathing-air contained in HP dive cylinders. These self contained facilities provide a complete tyre changing and repair facility in remote operations for tyre sizes up to and including DROPS IMMLC. Designed within the constraints of 2 NATO post pallet these units provide a self contained compressed-air source and tools for track maintenance on the Challenger 2 MBT. The General Purpose Combat Power Tool Kit provides the REME and Royal Engineers with a 4.5 kVA diesel driven mobile generator and comprehensive range of Makita tools and ancillaries including: drills, grinders, saw, breaker, work bench pump and lighting set. All of these ancillary items are supplied in tough polyethylene carry boxes with individual trays to protect each component. In addition the GPCPTK is also supplied with a power smoothing unit to provide a stabilised power supply for sensitive electronic devices. 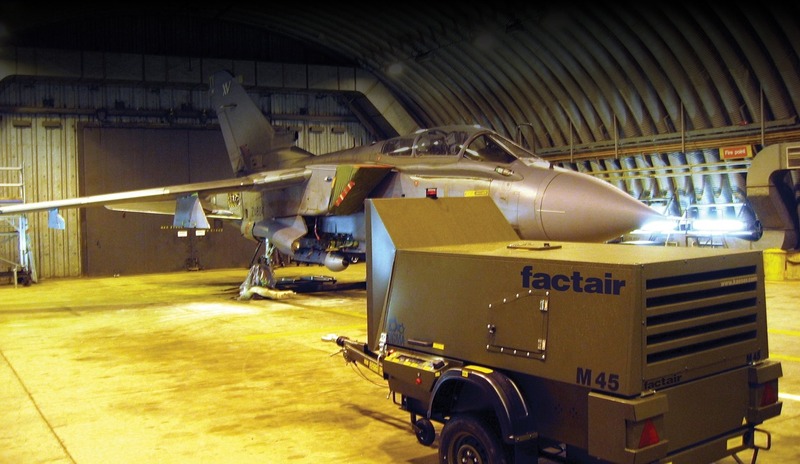 Factair's specialist engineering team is able to apply its extensive knowledge of compressed-air and pneumatic systems to a vast range of problem solving solutions for the military applications. 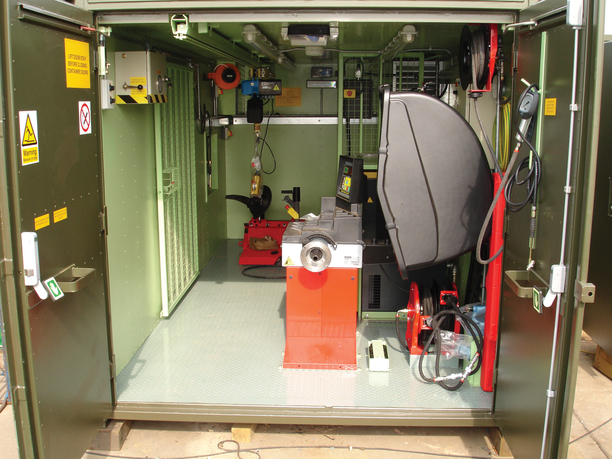 Examples of projects range from the Portable Tyre Repair Facility installed within an ISO 20ft container and capable of being transported on a drops vehicle to analysis equipment used to check for contaminants in breathing-air supplied to RAF paint spraying facilities. Factair's expertise has also been applied to provide fully automated breathing-air supply systems for operatives working within aircraft fuel tanks. Each of these projects can be supplied with a comprehensive Contractor Logistic Support package.